3% Solve Rate — . :: GSA SEO & Marketing Forum ::. Hello, I'm currently using the trial version of CB, and the solve rate is 3%, now I know that's not normal, I see people complaining with 50% success rate...so yeah. What am I doing wrong? I am using all types of engines to post on if that helps. If you're using it with SER, you can uncheck the "run as webserver" option you have enabled in CB. It looks like you're trying to emulate all captcha services with CB, that isn't necessary. The success rate is low because not many captchas have come through yet. 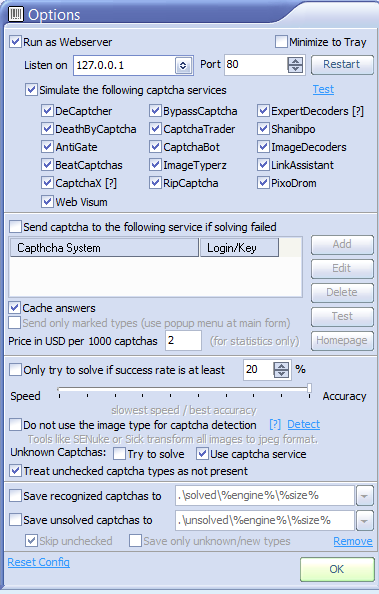 Keep in mind that some captchas have lower success rates than others so if CB received a lot of captchas recently that were harder to solve, the success rate will appear low until other easier to solve captchas start coming through. It all just depends on what captchas are coming through CB at the time, but success rate should improve if you let it run longer. Thanks for the reply @s4nt0s ! Hopefully I'll get the captcha solve rate to raise after a while!